Fourteen Years In The Making-Well Worth The Wait! It has been fourteen years since Gear Fab Records released Hawaiian power Trio Sweet Marie’s second LP ‘Stuck In Paradise’ in 2001. 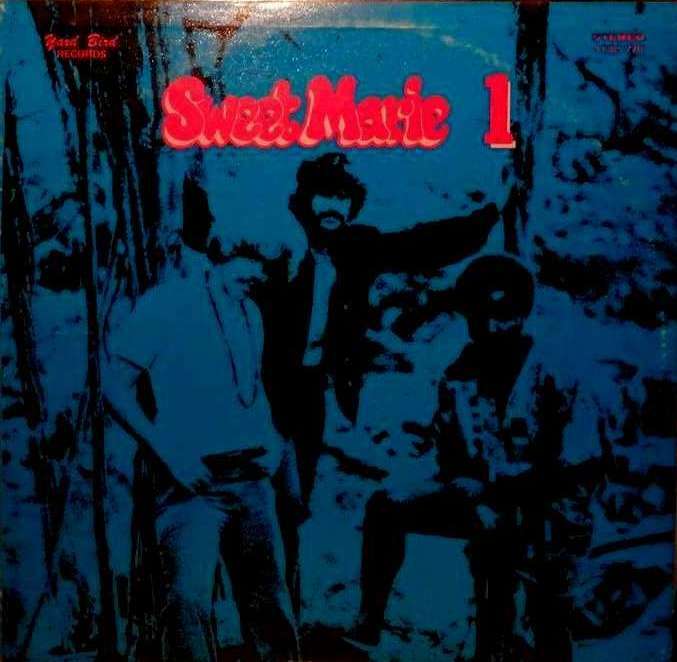 Now music fans can finally hear the debut LP of the band simply titled ‘Sweet Marie 1’ recorded and released 45 years ago in 1970. ‘Sweet Marie 1’ leaves no doubt in the listener’s mind that it was well worth the wait. Sweet Marie were formed in 1969 when bassist/vocalist/songwriter Prince Teddy approached guitarist/vocalist/songwriter Sonny Lathrop and drummer/vocalist Willy Bims, who had been the drummer for songwriters Tommy Boyce and Bobby Hart and thus played on many hit records of the 1960s including those of The Monkees, to form a band. The group started playing after hours gigs in Hollywood and by 1970 had recorded ‘Sweet Marie 1’ at Commercial Recording Company, Honolulu, HI working with engineer Ken Hiller. The band produced, arranged and played all the instruments and sang all the vocals on the LP. Sweet Marie released the single ‘Remember Mary’ c/w ‘Don’t You Understand’ on the Yard Bird label in 1970 and the single did extremely well on the Hawaiian charts and even made waves in several states within the US. The a-side is evidence of the huge influence Jimi Hendrix had on the band, Lathrop in particular, with its references to ‘Foxey Lady’ ‘Fire’ and ‘The Wind Cries Mary’. The beat builds steadily thanks to the ever reliable rhythm section of Teddy and Bims until Lathrop’s guitar roars and the listener is treated to the first of many tasty solos by Lathrop. The b-side features a much lighter feel and a nice hook as well as gorgeous vocals by Lathrop. Both sides of the single are included among the twelve tracks (38 minute run time) found on this reissue. The LP was likewise originally released in 1970 by Yard Bird Records. Throughout the album the quality of songs is high as are the performances of the trio. The rhythm section of Prince and Bims is tight throughout the album and consistently pushes the beat while leaving Lathrop plenty of room to explore with his guitar. The album is full of monster riffs by Lathrop on tunes like ‘Sweet Pea’ and ‘If You Love Me’ and killer solos on virtually every tune, ranging from the tastefully restrained ‘Standin’ By The River’ and ‘Bugalusa Baby’ to the wah wah drenched ‘Goin’ Down The Road’ with its ‘Voodoo Chile’ vibe and the fuzz filled ‘Dr. Feelgood’ which along with the album closer ‘Its Your Love’ display the gorgeous vocal harmony capabilities of the trio. The band’s versatility shines equally on lighter, gentler numbers such as ‘You Don’t Understand Me’ and the Tim Hardin influenced ‘Thru Rusty Windows’ so reminiscent of the classic ‘If I Were A Carpenter’ with its ethereal vocals and gentle tempo. The band was quite capable of driving rhythm and blues numbers such as ‘If You Love Me’ which brings Curtis Mayfield, among others, to mind as well as catchy pop songs like ‘Walk Marie’ and ‘Dr. Feelgood’. Rare indeed is it to find a band equally comfortable playing down and dirty heavy rock and gentle, hook laden pop songs the way Sweet Marie was. On the strength of ‘Sweet Marie 1’ the band went on to record ‘Stuck In Paradise’ in 1972 as well as the unreleased third LP. ‘Sweet Marie 1’ belongs in the collection of fans of 1970s psychedelic music and rock and roll of the era in general. The Gear Fab release includes a foreword by label owner Roger Maglio and a short essay as well as track annotations and recording information. Kudos to Maglio for his patience and persistency in seeing this album reissued. Here’s to hoping Sweet Marie’s third LP does see release and it doesn’t take more than a decade to appear!